A survey was conducted by SeniorWise among the readers of the Dutch website ‘Alleszelf.nl’. The results show which functions seniors find important and which kind of support they desire when using digital devices. The survey was conducted in February 2016 among the readers of Alleszelf.nl, an informative website that supports seniors to live at home independently. There were 197 participants, 51% female and 49% male. The youngest participant was 53, the oldest 93 (median: 70). The chart below shows which devices are used. 57% of the participants use a tablet daily and 75% use a computer (desktop or notebook) daily. How often are digital devices used? For which functions do seniors want to use their digital devices? We questioned which digital functions seniors find important in the areas of communication, information, tools, multimedia, entertainment and healthcare. It did not matter on which kind of digital device (tablet, notebook, desktop, smartphone, television, etc.) they would want to use these features. The table below shows the ranking of the functions. The higher the score (scale 1-5), the higher the importance of the function. The ‘n’ depicts the number of respondents, which differs per question, as participants were not obliged to answer. 27 2,91 184 Monitoring of weight, blood pressure, blood sugar, heart function, lung function, etc. First, the results show that communication functions are generally important. However, video telephony scored lower than expected. A possible explanation could be that seniors would not like video telephony to replace in-person communication. Another possible explanation is, that seniors have not experienced this function in practice and therefore do not see the benefits yet. Second, the question about WhatsApp (rank 10) received significantly fewer responses than the other questions (166 vs. at least 182). This indicates that a number of participants did not know what WhatsApp is. On the other hand, for those who do know what it is, it seems to be quite important and more important than SMS, which is only on rank 28. Third, the top-3 functions (e-mail, online banking, surfing/browsing) are those functions for which there are no good alternatives in the analogue world. For other functions, such as news, people can still decide if they want to consume it in an analogue way (e.g. newspaper) or in a digital way (e.g. news app). The better the analogue alternatives, the lower the ranking of the digital functions. Which other functions do seniors want? We also questioned, whether the participants would want to install additional apps from the Apple App Store or Google Play Store. 67% confirmed that they would want to do this for sure and 28% said they would maybe do this. And, by the way, nobody wants to use their tablet as a cutting board. 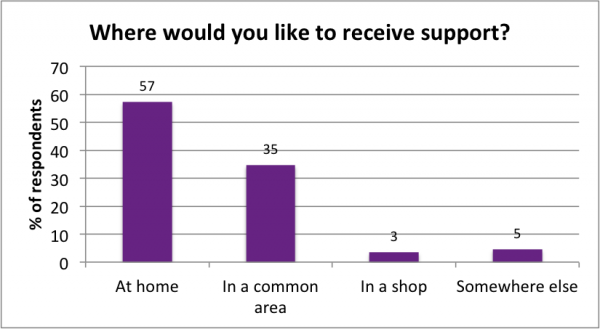 Which kind of support do seniors desire? 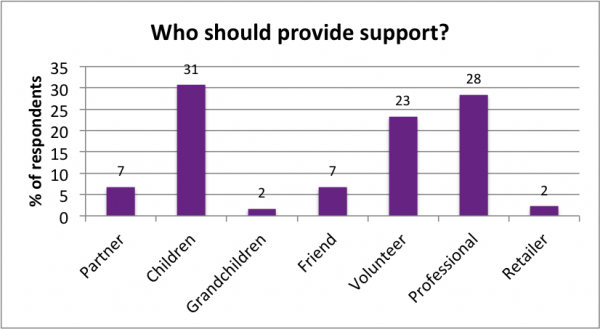 What are seniors willing to pay for professional support? We also questioned the participants, what they would be willing to pay for professional support, i.e. support by a person who is trained in and gets paid for explaining digital functions in an understandable and patient manner. The chart shows that seniors’ willingness to pay is generally low, if one considers what a trained professional actually costs for his/her Dutch employer. Producers and retailers of digital devices for seniors must provide support, but need to manage costs. Therefore they will need to find clever ways of delivering support, e.g. via volunteers or by partnering with professionals who are on the road anyway, such as postal services. Have a look at how Apple solved this challenge in Japan. 57% of the participants in our survey (median age: 70) use a tablet or smartphone on a daily basis and 75% use a computer (desktop or notebook) daily. Seniors mainly want to use these devices for communication functions (e-mail, telephony, calling for help) and for those functions for which there is no good alternative in the analogue world (e-mail, banking, surfing/browsing). 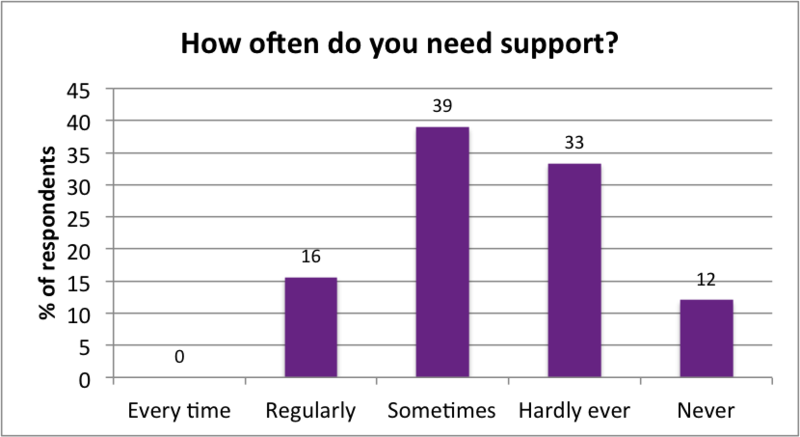 68% of the participants only need support in case of problems, whereas 19% would prefer regular training. 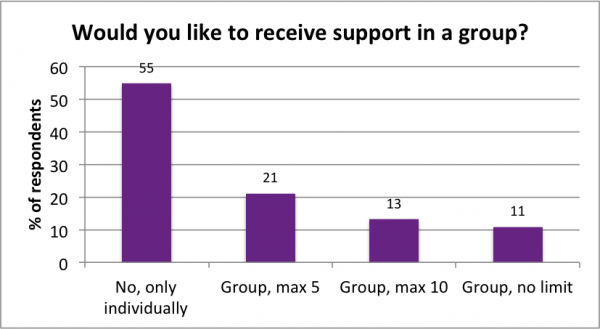 They want to receive the support individually (55%) or in a group of at most five people (21%). Those who should deliver the support are preferably their own children (31%) or professionals (28%). Seniors’ willingness to pay for professional support is low (compared to actual costs for employers), which means that producers and retailers will need to find cost-efficient ways of delivering it. 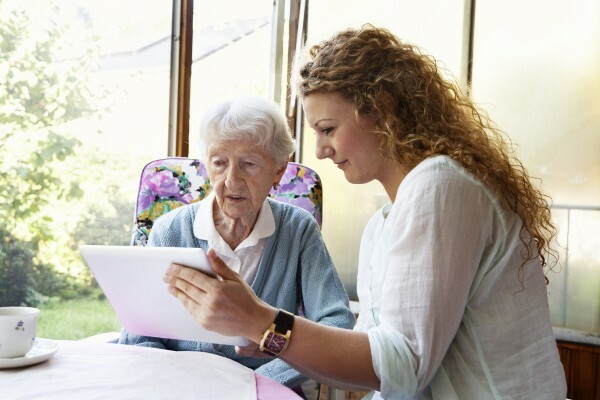 When seniors consider buying a digital device, two of the factors that play a role are the functions of the device and the availability of support. The results of this survey enable the producers of digital devices and software for seniors to prioritize the right functions and to reconsider their support strategy. Because we recruited participants through the internet, the findings of this research should not be generalized to seniors who are not yet online. Results may be biased towards known functions, i.e. those functions of which people have already experienced the benefits. The differences in ranking between functions that are close together on the list might not be statistically significant. Willingness to pay for support may be higher in reality, when people experience a real problem that needs to be solved. SeniorWise (2016). How seniors want to use their digital devices. 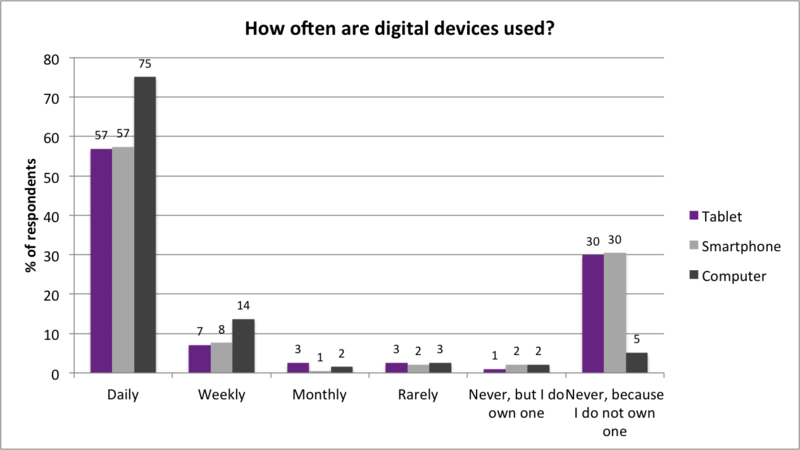 Retrieved from https://www.seniorwise.eu/en/articles/how-seniors-use-digital-devices/. If you would like to learn more about how to design tablet software for seniors, have a look at our report for producers. If you are a consumer and you would like to get advice on which tablet you should buy, please read our tablet buyers’ guide for seniors (in Dutch).